“All the doubting Thomases that we dealt with back in 2000-and-Something said it would never work. 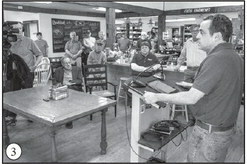 Well, they underestimated Vermonters, and today South Woodstock is a place which has high-speed fiber optic to the home, and that’s putting us on the map,” South Woodstock resident David Brown enthused on Monday at a celebration for the new internet cafe located inside the South Woodstock Country Store. The internet cafe is a milestone for ECFiberNet which just last week lit up its 2,500th customer in the 24-town consortium that it has been building fiber-optic communication services into for the past decade. Brown, who works for ValleyNet – which designs and builds the fiber network that forms the backbone of ECFiber, recalled the early days when backers of the once-wobbly startup went door-to-door in South Woodstock and raised $147,000 from residents who wanted real access to modern telecommunications. Those loans ended up being paid back early with interest when the company secured financing into the millions from larger backers but residents made it clear they still wanted the high-speed service more than they wanted their money returned, Brown recalled. It was because of that ardent enthusiasm within South Woodstock for the project that ECFiber, which has now lit up customers in 21 of the 24 towns it is targeting, pushed hard to get a link from their installation in Brownsville up over Rush Meadow and Morgan Hill Roads to the 200-year-old country store that has recently been renovated by new owner Simran Johnston. “Simi stepped up and said, ‘Guess what? 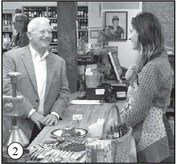 We are going to re-do the store!’ and we said, ‘Let’s do an internet cafe here,’” Brown explained, noting that the link was ultimately made possible by “some local businesses with global reach that are running out of barns and basements” along the route the fiber took to get to South Woodstock. Thomae explained that ECFiber is actually a “super town” comprised of the 24 member towns which, under Vermont law, get treated the same way that a town or municipal body such as a solid waste district would be. So ECFiber is technically a “Telecommunications Union District” with delegates from each of its member towns having a vote in how it is governed. Beginning with a demonstration project in Barnard in2010, ECFiberNet connected their first customer just three days before Tropical Storm Irene hit, and they have since put 530 miles of fiber-optic cable in service in 21 towns, a few of which are now almost connected border-to-border. “This is an amazing milestone to be here in South Woodstock, a place that did not have much connectivity of any kind, and be able to celebrate – not just pretty good connectivity – but excellent connectivity,” Dunne said. “A hundred years ago getting electricity was important, and the parallels are really similar,” Dunne noted, harkening back to the “homework gap” that existed between kids who could stay up and read at night and those who couldn’t before the advent of the federal government’s Rural Electrification Administration. “Today the difference in having broadband or not is also the difference for future-economy jobs the ability to have remote positions with any company anywhere,” Dunne said. Johnston said that over the past couple months the internet cafe has been part of the store’s regular 6:30 a.m. to 6 p.m. rhythm (7 to 4 on Sundays), and it quickly proved to be a hit. David Brown of Woodstock speaks about how the South Woodstock Country Store has the first of a series of planned internet cafes in the towns ECFiberNet serves. Store owner Simi Johnson, right, said in the two months since the internet cafe has been up and operating, the store has become an obce during the day for many of South Woodstock’s residents. ECFiber booster and former gubernatorial candidate Matt Dunne of Hartland addresses the two dozen attendees Monday.